Save money and enjoy stress-free travel with WeSwap. Spend all over the world with our global travel money card, whilst saving up to 90% on fees. It's simple, secure and safe. Get going in minutes and keep track of your money abroad. Our favourite bit? You get the best exchange rates and avoid the high fees of banks and bureaux. Want more? How about free ATM withdrawals over £200, a beautifully simple app and a worldwide accepted card! Load up your account, tap to swap your currency and enjoy your holiday. You can use your multi-currency card anywhere Mastercard is accepted, in millions of restaurants, bars and shops aswell as ATMs. Need to top up or check your balance? Download the app and take full control on the move. 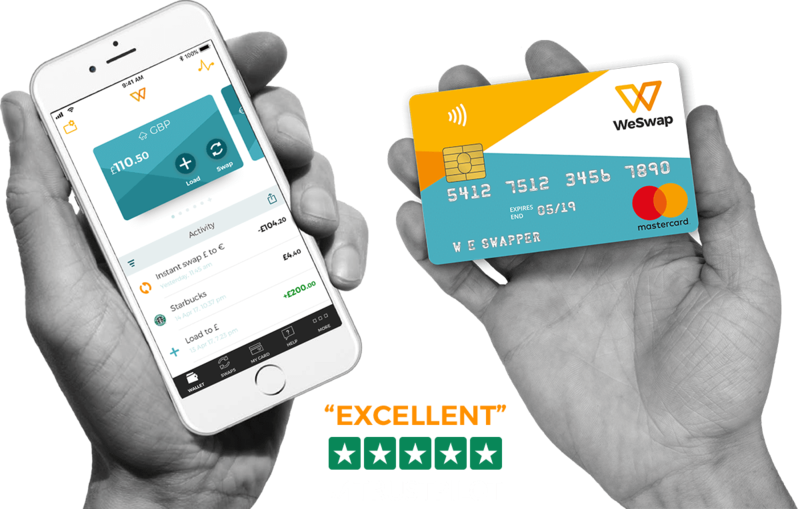 Why a weswap travel money card? 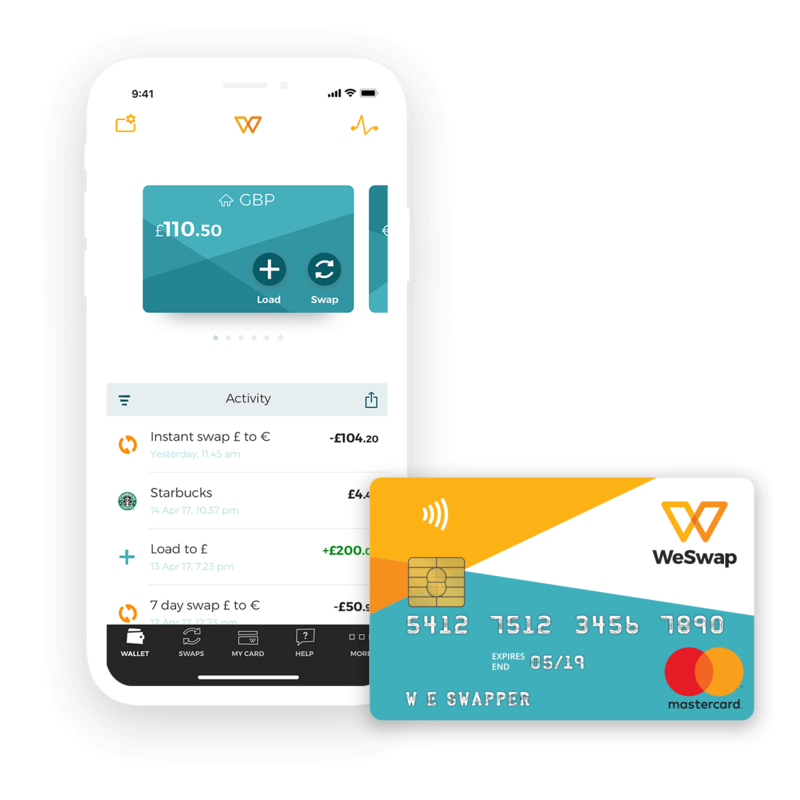 WeSwap is up to 90% cheaper than banks and bureaux. Say hello to more sangria, more pizza, more happy. Free to sign up, free to top up and delivered to you completely for free plus no ATM fees from us when you withdraw more than £200. Think you’ve lost your card? Lock it in app while you look – then unlock when you find it. Panic over. Sign up in just 2-3 minutes and your prepaid travel card will be delivered to you in 3-5 working days. Perfect for shops, restaurants and withdrawing cash. However as it is a prepaid card we don't recommend it for reserving hotels, cars, on cruises or at automated petrol pumps or toll booths. If the ATM gives you the option of credit or debit, always select credit, and if they ask you to accept an exchange rate always select no as you have already swapped your funds. 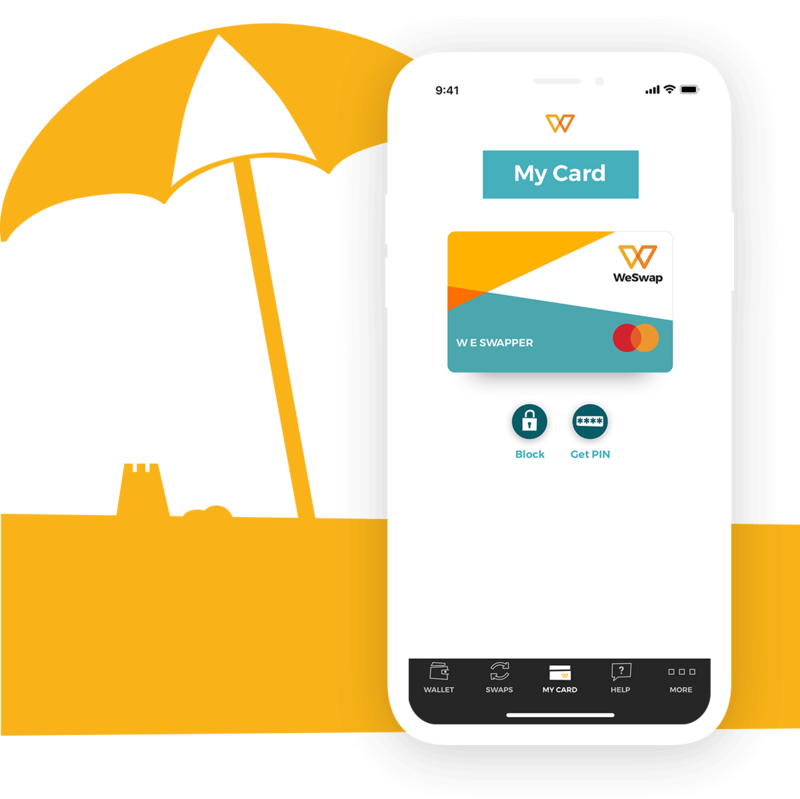 WeSwap is made for your holiday and works in any ATM or store around the world that accepts mastercard. We offer smaller domestic limits as travel is its primary use. Use your WeSwap travel money card globally at millions of atms and stores and pay just a 2% fee. If you are going to one of our 18 currency countries make sure you swap first to pay as little as 1% fees. Wherever you're going, we're right there with you, making your holiday cheaper. How does global spend work? Our 18 currencies cover around 80% of everyone's holidays, but 80% isn't 100% and we wanted to give you more. So as well as being able to swap into our 18 swapping currences, you can simply use your GBP balance to spend anywhere else in the world. As long as Mastercard is accepted, WeSwap is accepted. Just spend or withdraw from your GBP wallet, we will convert it instantly at a 2% fee. If you are in a country that uses one of our existing 18 currencies, continue to swap in advance so that you get the best rates and lowest fees. WeSwap Card cost: Zero. Zip. Zilch. 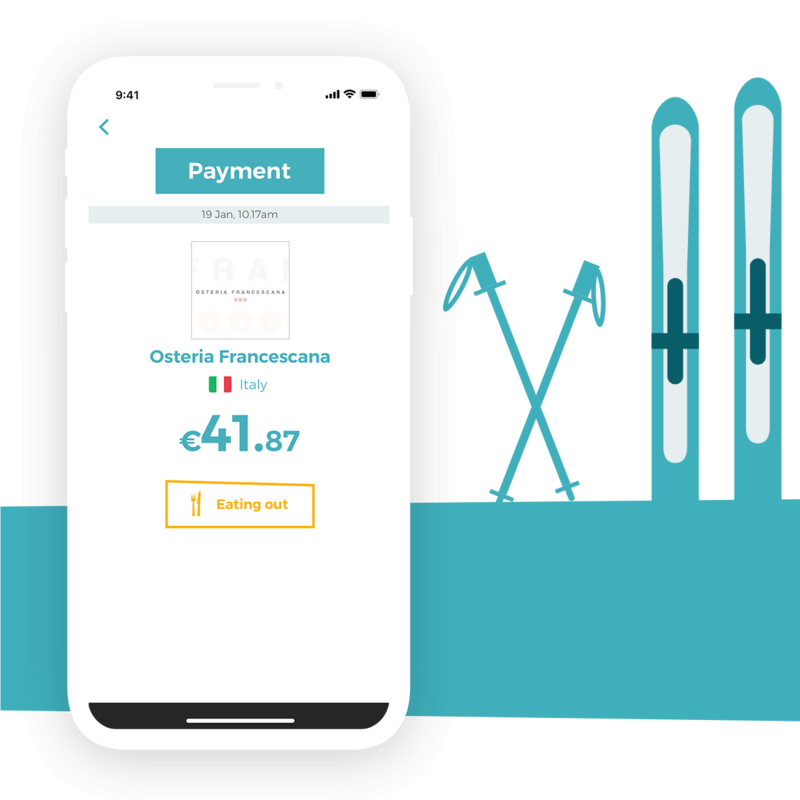 Globally Spend Fee: Use your GBP wallet anwhere in the world and pay just a 2% conversion fee. Transaction fees: Nope - none. Under this amount it costs £1.50/€1.75/$2.25. See here for fee withdrawals in other countries. You may incounter fees from the ATM operator or financial insitution but they should let you know before you complete your transaction. Lost card replacement fee: £4.95 (or equivalent in another currency). Refund fee: £5 for a bank or debit card transfer. What Currencies Can I Swap In? Think you’ve lost your travel money card? Forgotten your PIN? You can sort out both those things in the My Card section of your app. Simply go to the My Card section and tap "Block". This means all transactions will be declined. When you find your card just tap "Unblock" and carry on spending. If you need to talk to us directly please call our lost & stolen line on 020 3053 6610 or +44 (0)20 3474 0747 and we will help block it. There will be a £5 fee for replacement cards, which helps us cover the costs involved in the process. We make it easy at WeSwap. Click on the sign up button found on any of our pages or download the app. Follow the prompts to create your account. This should only take 2-3 minutes. Usually we verify your account automatically, you will get an email with a link to click and you're good to go. Once verified, we'll send your WeSwap card out. It should arrive within 3-5 working days in the UK, or within 10 days if you live outside the UK. Your card will be in a plain envelope with no WeSwap branding - this is for security - so keep a look out for it! Top tip: you don’t need to wait for your travel money card to start using your account. You can load and swap while you wait to put your card straight to use when it arrives. Easily load, swap, & check your balance on the WeSwap app. You can check the live rate of currency pairs, block or unblock a lost card, and see live transactions. Get started and join the community by downloading today.